Billy Taylor, a 31-year-old landscape business owner from Northeast Philadelphia, is the permit holder for many protest/demonstration areas when the Democratic National Convention arrives in town in late July. Billy Taylor is a 31-year-old single father of two who owns a landscaping business in Northeast Philadelphia. He also finds himself in the middle of evolving discussions about how protests will be conducted and handled when the Democratic National Convention comes to Philadelphia next month. His name is on four of the six city-issued permits for protest "zones" in FDR Park, somewhat-near the Wells Fargo Center, along with others in Center City and Independence Mall. To hear Taylor tell it, as PhillyVoice did on Wednesday, it was all a matter of timing. While he self-identifies as a long-time activist in the city, Taylor admitted that the size and scope of this effort far exceeds anything he's done in the past. 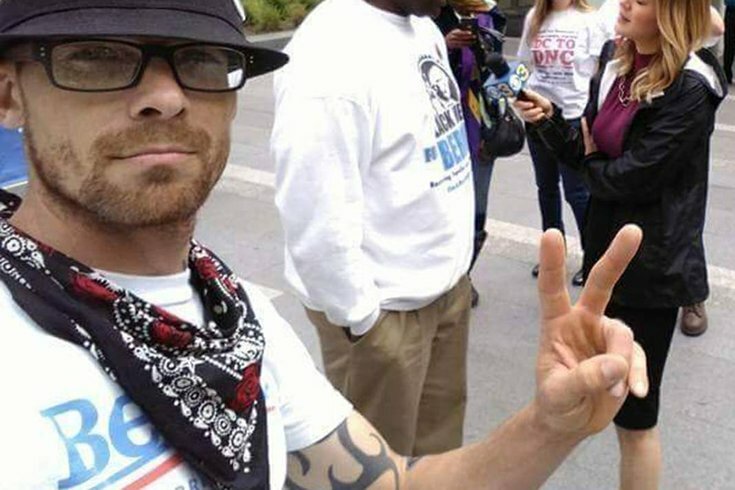 While other groups are champing at the bit to get access to those four FDR Park protest zones, including the Sanders campaign itself, Taylor noted that the events with which he’s aligned aren’t protests, per se, but to support the group’s expressed purposes and put the Democratic Party itself on blast. Even if they have to do so far away from people entering the building. “There will be no violence. It’s a peaceful revolution,” he said, noting that “my advisory team is all from the 1960s so it’s a major advantage. In the '60s, there was no older generation there to mentor, to show them the ropes. Not only do we have the older generation now, but we have technology and Bernie showed us how to” spark a national campaign with limited funding. The planning process has not always been smooth, he said, even though there has been some cooperation between the sides. While they’re working with city officials to talk about protection, safety and other issues, he noted that the city canceled a meeting with the group on Wednesday. Taylor said he remains concerned about a replay of the 2000 RNC Convention “puppet warehouse” arrests. “With four weeks to go, we’re wasting a lot of time but there are a lot of questions that we still need to get answered,” he said. Billy Taylor speaks during an event outside Philadelphia's City Hall in advance of the Democratic National Convention. Taylor was issued several permits to conduct demonstrations in late July. 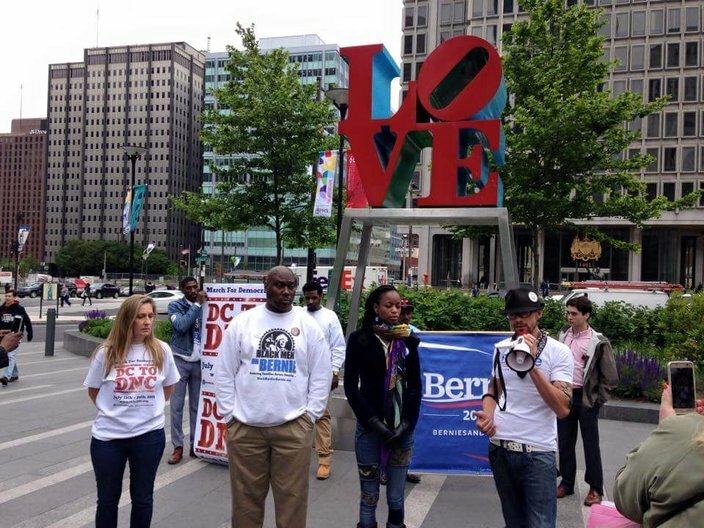 Philly.FYI – which will reach out to other grassroots groups in its mission to reclaim the Democractic Party – has already signed on with a “deregistration” effort broached last week at the Black Men for Bernie and Philadelphia Coalition for REAL Justice press conference in North Philadelphia. That effort will take the form of a unique march from Center City to the Wells Fargo Center. “We’re going to carry a coffin from the heart of the city to the convention filled with [documentation from those who deregistered from the Democratic Party],” Taylor explained. “It’s not only a ‘Bernie or Bust’ thing. They’re using fear tactics, but we’re not going to vote for a demon called Hillary because the other choice is a devil named Trump. And many revolutionary battles, many of which are listed on the group's website already despite lingering logistical uncertainty, will take place on land for which Taylor holds the permit for up to 30,000 people to make their voices heard in FDR Park, Independence Mall and Thomas Paine Plaza.